Last to the party – that’s me! Of course, people have been raving about Irene Nemirovsky since “Suite Francaise” made its appearance in English in 2006, but although I tried to read that work when it came out, I got stuck halfway. It’s taken me until now to really start to get to grips with her books – and I’m *so* glad that I have! Following on from “The Ball” (which I reviewed here), I started the next novella in the Everyman collection I picked up, “Snow in Autumn” – and what a wonderful work it turned out to be. 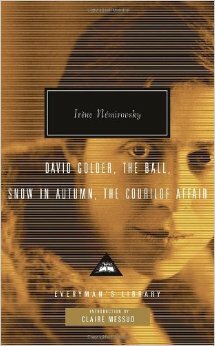 It’s hard not to see this novella in terms of autobiography, bearing in mind how events in it seem to mirror Nemirovsky’s life. And it’s a beautifully written, very evocative piece of writing, conjuring up the lost world of the Russian house, the confusion of the Civil War, the cold crisp snow in the woods. In fact, the snow is a recurring motif, representing all that Tatiana has lost, and its lack is a poignant reminder of how different the world the family has moved into is from that of their homeland.